She is part of some terrible anti-women policies of the US government. India was seemingly enthusiastic about the US first daughter and presidential adviser's visit to Hyderabad for the much-hyped Global Entrepreneurship Summit (GES). The summit has been designed as a catalyst of change in the process of women empowerment, and hence the theme - "Women First, Prosperity for All". There is no doubt that we need this kind of platforms to bring in more women into entrepreneurship and take our growth to the next level. The democratisation of entrepreneurship is the ideology that makes sense now, more than ever, especially when the world is passing through a tumultuous age of misguided version of capitalism. The GES kicked off in style with Prime Minister Narendra Modi and Ivanka Trump turning it into a superb photo op that was grand enough to draw the attention of global media outlets. The PR machinery also worked well in packaging it at multiple levels. “The theme - "Women First, Prosperity for All" makes this edition of GES stand out. In Indian mythology, woman is an incarnation of Shakti - the goddess of power. We believe women empowerment is vital to our development,” Modi said at the event. Ivanka also did well in her speech by calling for better opportunities for women entrepreneurs battling heavy odds around the world. Only when women are empowered to thrive will our families, our economies and our societies reach their fullest potential,” Ivanka said at the GES. “After my father’s election, I saw an opportunity to leave my businesses for the privilege of serving our country and empowering all Americans - including women - to succeed,” she added with a sense of pride. She also said that if India closes the labour force gender gap by half, the country’s economy could grow by over $150 billion dollars in the next three years. Ivanka seems to have said all the right things. The statistics and theme, however, necessitate a true revolution in women entrepreneurship as women comprise only 11 per cent in a base of 5,000 startups in India, according to a Nasscom report. An article in The Economic Times states that the number of women entrepreneurs who have received venture capital (VC) funding is even smaller — only three per cent of women-run startups are funded. So, we need a substantial change in promoting women entrepreneurship. And that's where Ivanka Trump doesn't fit in despite her much-touted presence as "a key figure in India’s biggest meet for women entrepreneurs". It seems India went terribly wrong in conceiving Ivanka’s credentials as a mascot for women's empowerment. Although she described herself as a champion of women's empowerment, I doubt Ivanka’s commitment and sincerity in her so-called movement for women. For, she is an adviser to US President Donald Trump, a man known for his grave anti-women approaches. Forget the fact that she is the president's daughter, and by virtue of that, holds the influential post. Unfortunately, she has done nothing to improve the condition of women. But most importantly, she is part of some terrible anti-women policies of the US government. In the US, there lies a strong argument that Ivanka’s approach is a kind of double speak when it comes to many issues, including the policies aimed at eliminating gender gap. In September, Ivanka issued a controversial statement that it will no longer require businesses with more than 100 employees to collect data on salaries by race, ethnicity and gender, claiming that the rule implemented by the Obama administration "would not yield the intended results". On one side she advocates for gender equality, and on the other, she refuses to acknowledge the fact that there exists a gender wage gap. “Ivanka’s well-developed brand as a poised woman of wealth and successful young professional is her top priority. Based on months of anti-women actions by the president, and the first daughter’s silent acquiescence, Ivanka has made clear her priorities. Ivanka has shown us who she is, and we have sadly learnt we cannot believe in her - we can only believe her,” a commentary on Fortune stated in September, following the gender wage gap issue. We can come to two conclusions here. Firstly, Ivanka is not bothered about her commitment to women's empowerment. So, all her statements calling for women's empowerment are nothing but a gimmick to fool the audience. As many people point out, she is a "fake feminist". Secondly, if that is not the case, Ivanka has no power to influence the president and she is incapable of correcting the policies of the Trump administration. The latter point is quite weak because if her ideology mattered, she was free to walk out of her role and do things independently. It's noteworthy to mention how futuristic entrepreneur Elon Musk dared to leave Trump’s economic advisory council in protest against the president’s decision to withdraw from the Paris agreement. I still don’t get what message Ivanka gave to Indian women entrepreneurs at the GES. 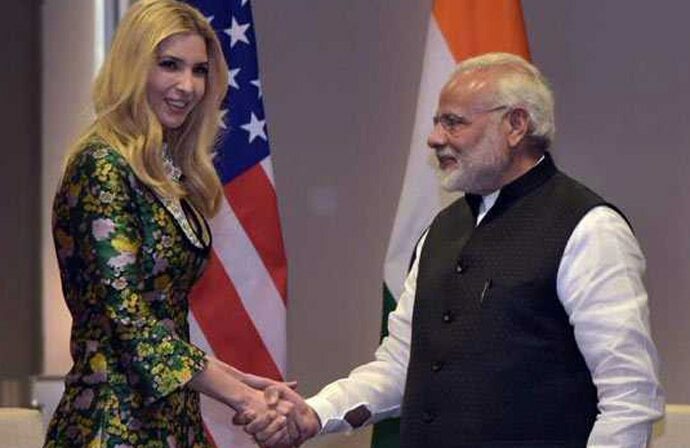 But, I am clear about one thing, by making Ivanka the face of a summit focusing on "Women First", India gave a wrong message to the cause of women's empowerment.